Frederick Gardner Cottrell (1877-1948) was born in Oakland, California, and his childhood hobbies included photography, electricity, telegraphy, and publishing a weekly newspaper. Cottrell received a B.S. in chemistry from the University of California at Berkeley in 1896 and did one year of graduate work there; next he taught high school in Oakland for three years, then journeyed to Europe to study first with Jacobus Henricus van't Hoff in Berlin and later with Wilhelm Ostwald in Leipzig, where he received his doctorate in 1902. He was a professor of chemistry at the University of California, at Berkeley from 1903 to 1911. However, his primary source of fame is as the inventor of electrostatic precipitators for removal of suspended particles from gases. These devices are widely used for abatement of pollution by smoke from power plants and dust from cement kilns and other industrial sources. He conducted his earliest ventures into electrostatic precipitation at the University of California, at Berkeley. As industrial smokestacks became a common sight at the turn of the century, Frederick Cottrell realized that pollution might be controlled and that valuable raw materials were vanishing into the atmosphere with the unwanted gases. Cottrell entered the pollution cleanup business because DuPont wanted to eliminate a problem in a process designed to manufacture sulfuric acid. DuPont hired Cottrell in 1906 as a consultant at its facility at Pinole. In 1907 he applied for a patent that passed high-voltage direct current to a discharge electrode which leaked the charge onto particles passing by in the fumes. These charged particles were then electrically attracted to an electrode with an opposite charge, where they could be collected and retrieved as valuable minerals or chemical compounds. Cottrell's electrostatic precipitator, which became known simply as a 'Cottrell,' used high voltage electricity to remove from 90-98% of the ash, dust, and acid which industrial smokestacks spewed into the air. Today electrostatic precipitators are found mainly on large power plants, cement plants, incinerators, and various boiler application. The term 'cottrell' can still be found in the unabridged dictionary. 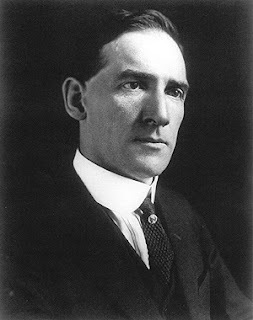 In 1911 he resigned from the university to join the United States Bureau of Mines, of which he eventually became director in 1919. There he worked in the World War I programs to develop processes to fix nitrogen for explosives and to distill helium from air for lighter-than-air craft. From 1922 to 1930 he served as the director of the Fixed Nitrogen Research Laboratory in the Department of Agriculture. 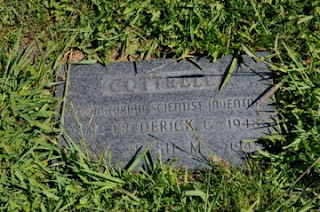 Next to the electrostatic removal of particles from smokestack gases, Cottrell is probably best remembered for his creation of the Research Corporation in 1912 with the help of Charles Walcott, then secretary of the Smithsonian Institution. This foundation was set up to receive income from his patents and the patents of other public-spirited inventors and to distribute these funds to university researchers in the physical sciences as seed money. The Research Corporation provided funds for Ernest Lawrence's development of the cyclotron, R.H. Goddard's experiments with rockets, the processes for volume production of vitamins A and B1, and some of Robert Burns Woodward's early organic syntheses of complex organic molecules like the drug reserpine. The foundation continues to underwrite scientific research that might not otherwise gain support and has helped to secure and develop over 750 patents. prof premraj pushpakaran writes -- 2017 marks the 100th birth year of Robert Burns Woodward !! !